This blog will feature hardware FAQ's, how-to articles, DIY stuff, links to people using our hardware, etc. What is the Difference Between Glass and Crystal? If you read our blog about acrylic vs. glass, you may also be interested in the difference between glass and crystal. What we refer to as crystal originally started as lead glass; where lead was introduced into the chemistry (as lead oxide, PbO) of glass making it shinier and easier to work with. True crystal is usually defined as having a minimum of 24% lead. Lead was first added to glass on an industrial scale in the 1600's. It makes the glass denser and decreases the speed at which light travels through it. This causes refraction of the light. Lead Crystal has an index of refraction of n = 1.7, which means it reflects light greater than regular (soda-lime) glass and is therefore more brilliant. In addition the light is refracted into it's component wavelengths which is what causes rainbows. An interesting note is that the term "crystal" actually refers to a particular property that pertains to solid matter when their atoms and sometimes molecules form an organized lattice structure in space. Ice for example is, at an atomic level, a crystal; when we look at it from an atomic level we see the atoms arranged in a structured pattern. Ironically glass does not have this crystalline property and therefore referring to crystal glassware as "crystal" is actually a misnomer. Now a days true "Lead Glass" is rarely manufactured due to the health risks associated. Lead is extremely poisonous and hazardous; it can cause severe damage to various body organs and even death if exposed. The lead from lead glass containers contaminates stored liquids, therefore never ingest anything stored in lead glass! In place of lead barium oxide, zinc oxide or potassium oxide are used. And so finally this brings us to the question I am sure you have all been asking yourselves: Why do crystal glasses sing, but soda-lime glasses do not? The changes in properties of the glass when infused with lead are not only responsible for the physical differences between crystal and glass, but also the acoustic differences. 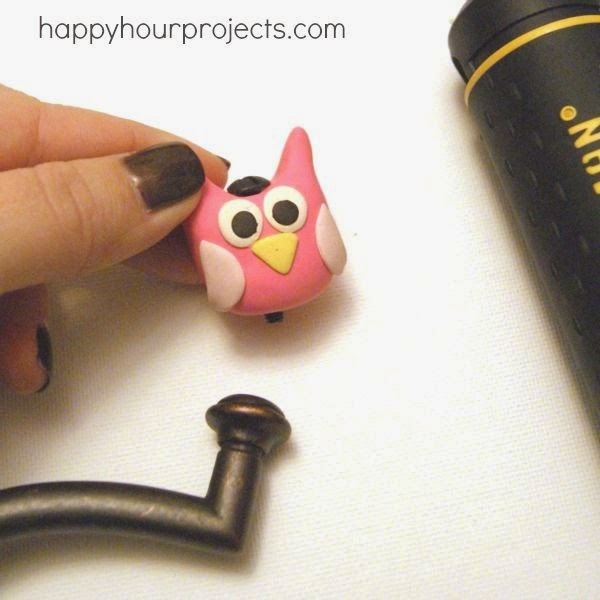 A fun and simple do-it-yourself project is constructing your own hooks. All you need is to pick out a base, pick your knobs and then right screws and you are all set! We have 3 styles to choose from in our hook base section: Antique Brass, Antique Pewter, and Oil Rubbed Bronze. The section is also complete with screws. As you can see from the picture you will need to get a knob that has a hole through the middle or built in screw. 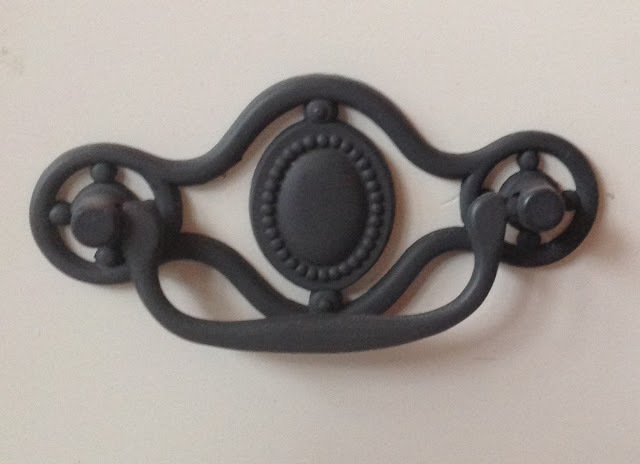 There are thousands of different looks you can give your hook with the variety of knobs available. You can even do something crazy like Adrianne at Happy Hour Projects did for her daughter as seen below where she crafted unique clay "knobs" for a really cool kids hook. A very common choice are antique glass knobs. These knobs give the entire piece an elegant look and there are many colors and cuts to choose from. The hook base comes with screws so as long as your knob has a hole through the middle you can use it. 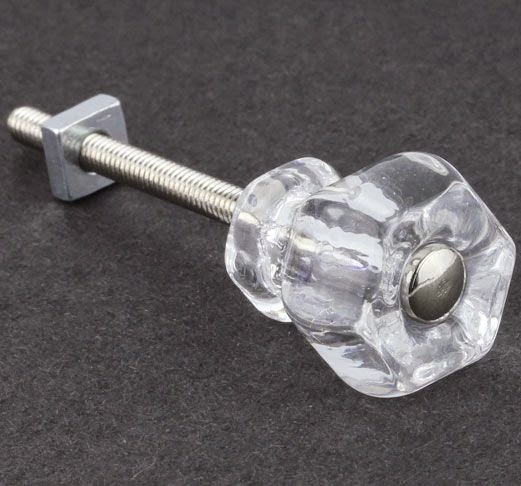 Many knobs come assembled screwed to a base, if it isn't glued all you would have to do is unscrew it and remove the actual knob to use it on your hook. If you like to get creative you can mix and match knobs, another easy way to give your hook a unique look. You could also use a wooden knob - even paint an unfinished wooden knob and really adding some personal touch to your project. Take into consideration the size of knob your hook is made for. The hook bases shown here are for 1" knobs - therefore if you have a knob that is larger or smaller the screw will not fit right. However if that is the case do not worry, we have a solution - break off screws! These screws are great because you can actually break off the ends at specific points to make it different lengths. After all this the mounting is the easy part. 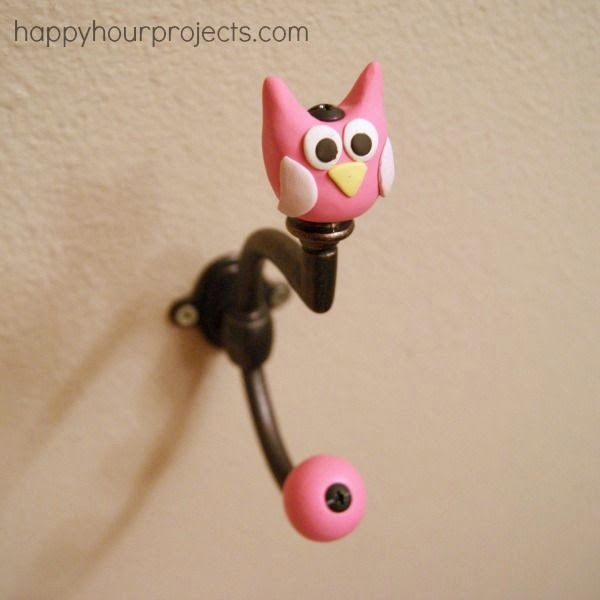 Just screw your knob or custom top onto the base and mount as you would any other wall hook. One of the most simple ways to make your own knob is by purchasing an unfinished knob and then simply painting or decorating it yourself. Knobs such as these are sanded and ready to paint. You can choose to have your knobs match the color of the furniture in which they will be inserted, or using complementary color can really add some life to a room. In addition, you could paint designs on them and truly make them unique. Above is one great example from the blog DD's Cottage. 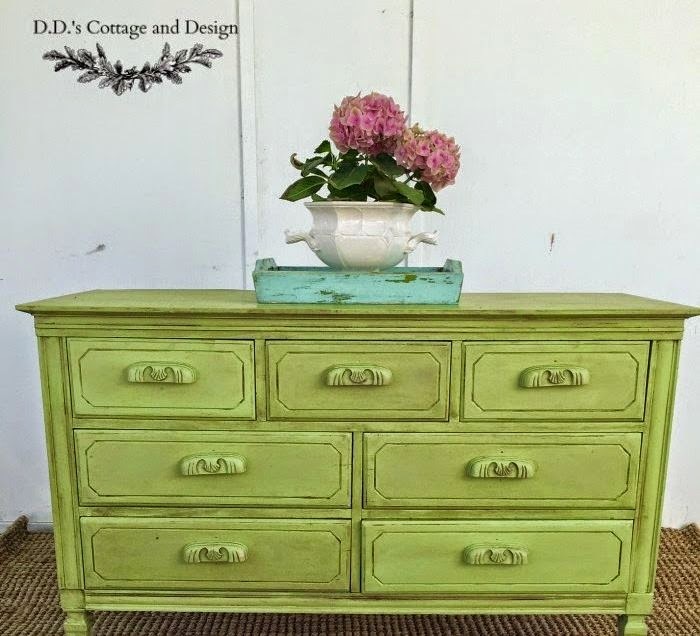 She stained and painted that unfinished pull to use on this dresser and the result was awesome. If you are going to paint your knobs only one color, most people will want the knobs to match the furniture upon which they will be mounted. However there is no law against painting your knobs a different color and if done right it can add life and flavor. If you want to add a design to your knobs, what I would recommend is first drawing out the design that you would like on paper. Consider the difficulty of design - if there is much small detail, it might be difficult to paint onto the knob. 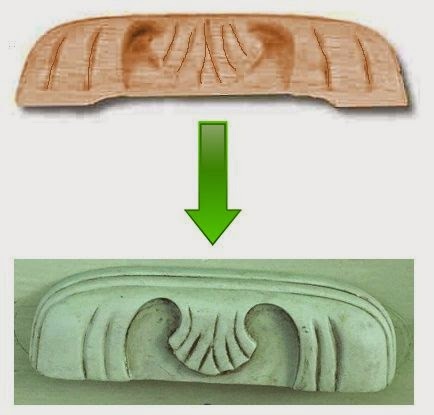 Once you have decided on a design, Depending on the intricacy I would cut out a stencil with an X-Acto Knife, thus ensuring that the design is the same on every knob. You can use the stencil every time you paint, helping to keep it neat, or you can use your stencil to trace the design onto your knob with a pencil. If your design is fairly intricate and you are going to use different colors, you could cut different stencils for each color - this ensures that you do not accidentally paint the wrong part of the design with the wrong color and just makes it more difficult to mess up in general. If you want your work to last, then the best way to do it is to start with a primer. Wipe down the knob with a damp cloth to remove any dirt or dust that may have accumulated. Then you can apply the primer, one coat is usually good enough, but depending on how dark the wood is and what color you are using, you may want to apply two coats. Make sure the primer is fully dried before applying any paint (which may take up to five hours per coat). Once the primer is dried you may start painting, for furniture it is usually best to use glossy paint. Use a thick brush for the base, make sure to get excess paint off the brush and try to keep your brushstrokes as even as possible. If you are using one color, then all you have to do is wait for the first coat to dry (again, this could take up to five hours - it never hurts to wait longer) and then apply the second coat. If you are going to add a design, then here is where your stencils come in. Use the stencils from bottom up - that is, starting with the part of the design that comprises the background first and moving forward. Also, make sure to tape your stencil firmly to the knob or pull so that it doesn't move and smudge your work and also so that paint doesn't sneak in underneath. Finally, it is a good idea to keep the stencil in place until after the paint has dried for the same reason. Once all the painting is done, it is important to apply a protective top coat. The best thing to use is a semi-gloss or gloss; polyurethane based finish is a good choice. You can apply one to three coats depending on the finish you are looking for; two coats is the standard however. Again, you want to make sure the each coat is completely dry before applying the next one; for polyurethane this may take up to a day. All in all this is an easy project that anyone can do and its especially good for getting that perfect color or finish when nothing off of the shelf will do. We have a great selection of unfinished knobs here. Making Your Own Hardware - The Possibilities are Endless!